USB hubs come in all kind of shapes and forms and most of them are pretty boring. But this DPad USB hub is fun and has lights as you can see on the picture. The USB hub looks like a black plus sign aka DPad and each direction has an arrow that lights up when you plug things in and that is kinda fun. 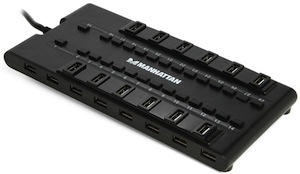 The USB hub has 3 ports to plug your devices in and will look unique and really cool on your desk. So time to change that boring hub on your desk with this way cooler DPad USB Hub With Lights. So you got a new laptop that only has a USB C port but how are you going to use all your old flash drives and other devices? No worries this USB hub will solve that problem for you. This hub offers 3 USB 3.1 ports and two SD card slots so that you have everything you need and it all connects to your USB C port of you computer. Why get a bunch of adapters when you can do it with one. And yes the USB 3.1 ports are downwards compatible so that you can even use those really old USB devices if you wanted to. Come take a closer look at this USB C To USB 3.1 HUB With Card Reader. USB hubs are just a great way to get USB ports when and where you want them. 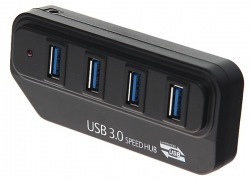 This USB hub offers 4 USB 3.0 ports and looks like it was made by Apple. The aluminium design looks a lot like Apple’s keyboard and Magic trackpad and that makes it fit in neatly on your desk. It would look great next to a laptop or what I would like it for is to place it under the screen of my iMac to have those USB ports right in front of me. And sure this Hub looks like a piece of Apple but it does work fine on a PC to. 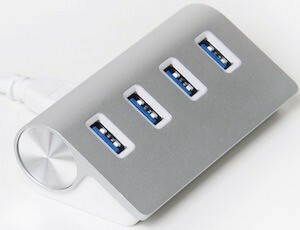 If you want a neat looking USB 3.0 hub on your desk then check out this 4 Port Aluminium Mac Style USB 3.0 Hub. If you like retro and are looking for a usb hub then you are in luck as this USB hub looks like a cassette tape. 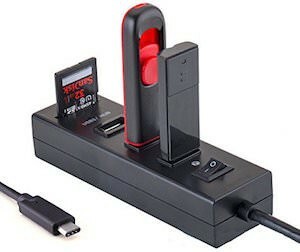 This USB hub offers 4 USB ports and is also a card reader for SD cards. But this mixed tape will not bring you any music just fun on your desk. The cassette tape hub is USB 2.0 and offers speeds up to 480MBS. 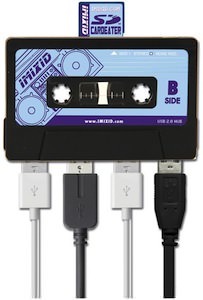 Come and check out this Cassette Tape USB HUB And Card Reader. So in the time that we where away for maybe the world has ended and all of you look like the skull above. We of course had a holiday so we will be fine. If you are still with the living then maybe you like something kinda freaky for your desk. 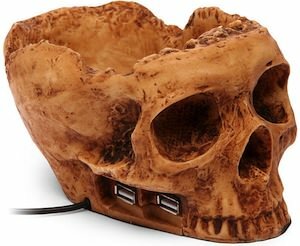 This is a skull shaped USB HUB with 4 ports it offers plenty of room for your USB devices and the top of the skull is like a little bowl to so you can store things in there, maybe some extra flash drives. If you want to have the strangest USB HUB of all your friends then come and get this Skull USB HUB. Notebook and laptops are getting smaller and smaller and often the result is less ports to use. This little USB hub will add two new ports to your laptop. And it does this by creating a 180 degree angle so that it will fit snug next to your portable computer without being in the way. So if you want more USB ports on your computer then come see this 180 Degree USB HUB. OK so you have a bunch of USB devices that you would like to connect to your computer. This HUB can help you with that. It has 28 ports of witch 4 are USB 3.0 and 24 are USB 2.0 and of course all are downwards compatible. And each port of this giant hub has it’s own on and off switch so that you only use it when you need it. This 28 ports hub is windows and mac compatible and will help you organize you devices. Of course a big hub like this comes with it’s own power adapter so that you can even use it to charge your mobile devices. Come have a closer look at this 28 Ports USB 2.0 / 3.0 HUB. USB 3.0 now really starts to make it’s mark on the market so if you are shopping for a new HUB then looking for a USB 3.0 one could be smart. This portable HUB has 4 ports and is USB 3 and of course all 4 ports are backward compatible with USB 2 and 1.1. The HUB has a power port for more power consuming devices (adapter not included) and will make your transfer speeds go up quickly. A small HUB like this is great for travel and at home. Come and check out this Portable USB 3.0 4 Port HUB. 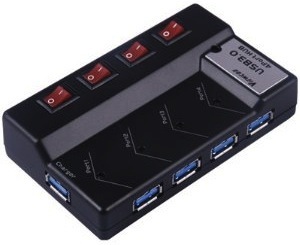 This 4 port USB HUB is different from most HUB’s. First of all it is a USB 3.0 HUB making it mutch faster then most hub’s if you computer has a USB 3.o Port build in. And it is of course down worth compatible with USB 1 and USB 2. The extra thing about this HUB is that each port has a on and of switch making it enegery efficient and easy to use as now you don’t have to unplug your device when you don’t want to use it. 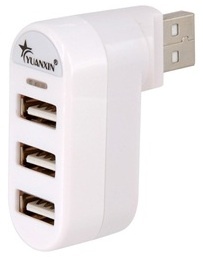 This HUB comes with a 5 volt power adapter to give enough power to your USB devices. Come have a closer look at this 4 Port USB 3.0 HUB With Switches. There we have another little USB HUB. This hub has 4 ports that can be used for any USB device but this hub is special. Each USB port of this hub has it’s own ON / OFF switch so that you can turn off devices not in use. This is not only handy if you don’t want the device to show up on your computer no it will also save power. If you like a switchable USB hub then check out this USB HUB With Power Switches.